Every year the Politic India comes with an article on the famous Chhatha festival of Bihar which spreads message of humanity, equality, love for nature, and importance of family and community bond . It carries the great tradition of Bihar to rest of the country and even various parts of the globe. The Chhatha festival redefines worship and people’s faith in a rational practice. The existence of human beings on earth depends on their relationship with nature. The happiness, the ultimate goal of human life is only possible if our relationship with nature is cordial. But human beings are miserably failing in maintaining the cordial relationship with nature and have invited threats to their own survival. In the name of mega developmental projects, the ecological balance is disturbed, leading to ecological imbalance and loss of biodiversity exposing the human race to the dangers of extinction. Poor people, Dalits and tribes living close to nature in forests and river basins since the advent of human civilization are often displaced without proper rehabilitation. We have failed to learn from the people who matter in maintaining cordial relationship with nature without disturbing ecology and biodiversity. Of late, we have realized the seriousness of the threats and taking measures on a global scale to undo the wrongs committed by us. The Chhath festival of Bihar has a great significance in reminding us to restore our congenial relationship with nature. It’s a festival which gives us a great sense of cleanliness of surroundings, rivers, ponds and other water sources and community involvement in it. It symbolizes the simplicity, equality, secularism and rationality in our traditional practices of worship and faith and rejects karmakandas and role of priesthood. The festival totally denounces any ritual based on religious texts and the role of a priest in any form. It is a festival which extends for four days, finally paying obeisance to the ultimate source of energy i.e. Sun with water, milk and local fruits, vegetables and homemade sweets prepared from flour and oil (pakwans) kept in bamboo soop and bamboo dala or tokari prepared by local craftsmen. It is a celebration of family, friends and community. Everything is done in the simplest way reflecting agrarian village culture. Earthen Chullah (stove) is universally used for cooking Prasad & Pakwan. Bamboo soops filled with seasonal fruits and pakwans are carried in bamboo tokari (basket) on foot from homes to rivers or ponds. It is very important to note that unlike any other festival there appears no disparity in the resources and amenities used by the rich and poor. It depicts the highest sense of self-imposed equality and respect for simple village culture. We find the promises and acceptance of a culture lived by our forefathers and a relationship where nature used to shower its blessings upon the humanity. We can explore the possibility of revival of the strong family bond, the social concerns of the community, self-sustained agriculture, sense of returning to diverse varieties of indigenous crops and trees, practices of protecting water sources, village craftsmanship, etc. There is no denial of the role of science and technology, but there is a need to reinvent the role of S&T which takes on context specific challenges to achieve development goals without destroying our identity and relationship with nature. The Chhath may, in fact, is a cultural ambassador of Bihar sends a strong message for maintaining strong family and community bond and congenial relationship with nature. It affirms public faith (Lok Astha) in family, community, simplicity, equality, rationality, civility and the central role of agricultural and crafts in development. One striking feature of this festival is that the setting sun is worshipped (offered arghya) first and the rising sun next. It gives us loud and clear message for making a humane society. Generally women play the pivotal role in the festival and men enjoy their supportive role. The local community works together in making arrangements for Chhath celebration at nearby river banks or ponds or other water sources. People pay obeisance to the setting and rising Sun together at these places. The festival has to do more with ‘way of life’ than religion. 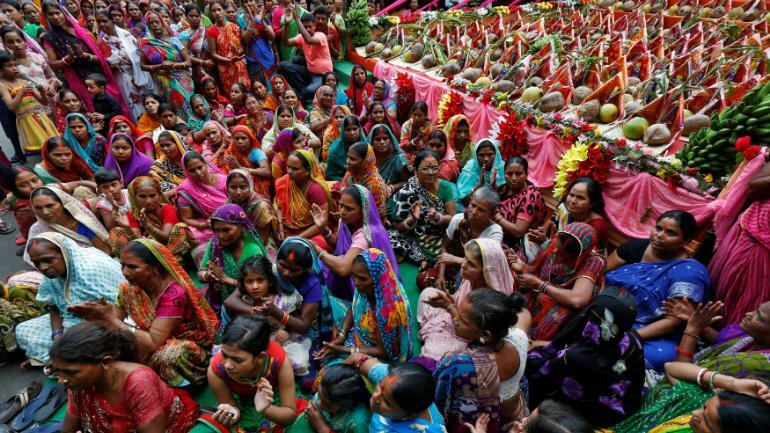 Local traditions are also reflected in folk Chhath songs which has now become very popular and are sung by a large number of local Bhojpuri and Maithili singers and many famous Hindi singers. Although, the popularity of this festival is increasing but we perceive the danger of intrusion of some rituals and loss of community feeling. The festival must be protected from inherent danger of gradual intrusion of rituals and loss of community feeling. Chhath, in a way, is the cultural ambassador of Bihar which spreads a strong message of humanity. It is a festival of assertion of indigenous faith in nature and great community life having strong potential for regeneration of a more liveable humane society. Wish all the readers of Politic India a very happy Chhath!